President Bush's nominee to head the CIA insisted on Thursday that the administration's warrantless surveillance program was legal and that it was designed to ensnare terrorists — not spy on ordinary people. "Clearly the privacy of American citizens is a concern constantly," Gen. Michael Hayden told the Senate Intelligence Committee at his confirmation hearing. "We always balance privacy and security." The four-star Air Force general was peppered by as many questions about the National Security Agency, the super-secret agency that he headed from 1999-2005, as about his visions for the CIA. Still, Hayden's performance seemed to appease even Democrats, who told CBS News correspondent Sharyl Attkisson that barring any unforeseen surprises, Hayden should sail through when the vote to confirm him is condicted. Hayden vigorously defended the program to listen to Americans' overseas phone calls without a warrant and decried that people found out about it, reports CBS News correspondent Bob Fuss. He rejected the view of many in Congress that the program illegal and insisted procedures are in place to spy only on people with a link to al Qaeda. 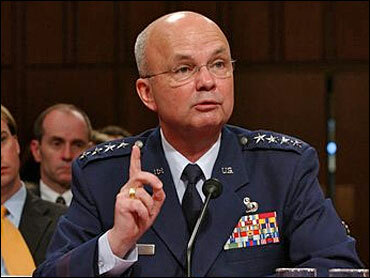 After the attacks of Sept. 11, 2001, President Bush decided that more anti-terrorism surveillance was necessary than the NSA had been doing, said Hayden. Hayden said he decided to go ahead with the then-covert surveillance program, which has been confirmed by Mr. Bush, believing it to be legal and necessary. "When I had to make this personal decision in October 2001 ... the math was pretty straightforward. I could not not do this," Hayden said. He said the surveillance program used a "probable cause" standard that made it unlikely that information about average Americans would be scrutinized. But he declined to openly discuss reports that the NSA was engaged in even broader surveillance, including a story in USA Today that the NSA has been secretly collecting phone-call records of tens of millions of U.S. citizens. Under questioning from Democratic Sen. Carl Levin of Michigan, Hayden said he would only talk about the part of the program the president had confirmed. "Is that the whole program?" asked Levin. "I'm not at liberty to talk about that in open session," Hayden said. A closed-door session was planned for later in the day. Also, Hayden didn't answer whether he will quit his Air Force post if he is confirmed to head the CIA. When asked if he's considering retiring, Hayden replied: "The fact that I have to decide what tie to put on in the morning doesn't change who I am." Hayden said it's important that he be able to "bond" with CIA workers. Hayden says if the uniform "gets in the way of that," he'll "make the right decision." Hayden was asked about reported friction between him and Defense Secretary Donald H. Rumsfeld over how the NSA and other intelligence agencies would work with the Pentagon, which has the lion's share of intelligence dollars. Had they disagreed, he was asked by Levin? "Yes sir," said Hayden. Hayden declined to answer a string of questions by Sen. Dianne Feinstein, D-Calif., saying he would answer them later in a closed-door session. They included whether he believed that "waterboarding," in which prisoners are strapped to a plank and dunked in water until nearly drowning, was an acceptable form of interrogation. He also declined to say publicly how long he believed the United States could hold terror suspects without a trial. "He didn't answer any of them," Feinstein said into an open mike as the hearing recessed for lunch. Meanwhile, White House spokesman Tony Snow expressed the president's full confidence in Hayden. "The guy's got a record of trying to take on big reform tasks and carrying them out," Snow told reporters. Hayden acknowledged a series of intelligence failures in the run-up to the U.S. decision to invade Iraq and promised to take steps to guard against a repeat of such errors. "We just took too much for granted. We didn't challenge our basic assumptions," he told the Senate Intelligence Committee at his confirmation hearing. He said that since launching the surveillance program a month after the terror attacks, targeting decisions have been made by NSA experts on al Qaeda. Asked by Sen. Kit Bond, R-Mo., whether a NSA analyst could intentionally look at information unrelated to suspected terrorist activity, Hayden said, "I don't know how that could survive." Committee Chairman Sen. Pat Roberts, R-Kan., complained about the CIA's performance on Iraq. While "nobody bats 1,000 in the intelligence world," Roberts cited "a terribly flawed trade craft" in the CIA's intelligence suggesting the presence of weapons of mass destruction there. At the same time, Roberts complained that the discussion among lawmakers had not been over Hayden's long intelligence-services resume "but rather the debate is focused almost entirely" on controversy over NSA surveillance and eavesdropping programs. Hayden, as expected, drew the most fire from Democratic members. "I now have a difficult time with your credibility," said Sen. Ron Wyden, D-Ore. In an opening statement, Hayden said that intelligence-gathering has become "the football in American political discourse" since the terror attacks of Sept. 11. He said the embattled agency "must be transformed, without slowing the high tempo under which it already operates, to counter today's threats." "Yes, there have been failures, but there have also been many great successes," Hayden said. If confirmed, "I would reaffirm the CIA's proud culture of risk-taking," said Hayden, who was selected by President Bush to succeed Porter Goss, who was forced out after serving for 18 months. Some Republicans on the committee also are very upset that they were kept in the dark so long about the NSA wiretap program and think the balance between the executive branch and Congress has gotten out of whack, Fuss reports. But Hayden is respected for his skills and he is very likely to be confirmed. Hayden's hearing before the Intelligence Committee was much different than a year ago, when the panel approved him unanimously to be the nation's first principal deputy director of national intelligence. Mr. Bush chose Hayden as CIA director-nominee after consultation with Hayden's current boss, National Intelligence Director John Negroponte. Goss announced his retirement earlier this month after disputes with Hayden and Negroponte about the CIA's direction.